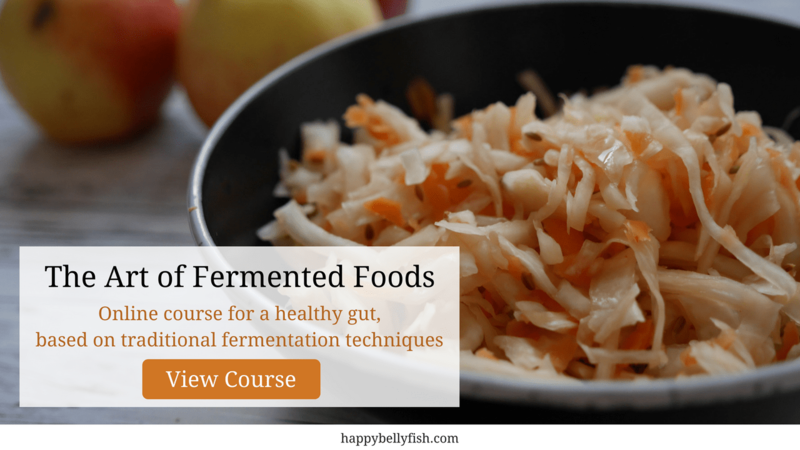 Sauerkraut is one of the healthiest fermented foods, and we will show you how to make it without salt! It is an easy recipe, following a Russian tradition of fermentation. Sauerkraut is one of the oldest fermented foods, that comes from Central and Eastern Europe. 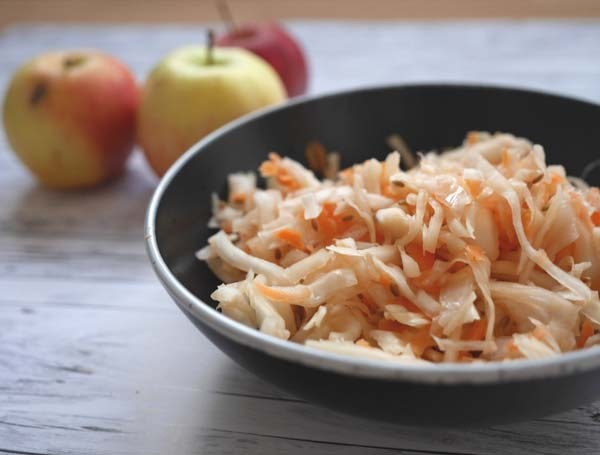 One can talk about health benefits of Sauerkraut forever – it is a fantastic aid for your gut, a plant-based source of probiotic, it’s full of fiber, Vitamin C and K, and our version is also low-sodium. In most recipes salt is used for pickling, but some people make a choice to reduce their salt intake. To make sauerkraut low-sodium we’ll do it in a very traditional way – we will let cabbage ferment on it’s own without any help of additional ingredients, namely, we will prepare saltless sauerkraut. Step 1. First of all you should remove just a few cabbage leaves from top. Put them away, you’ll need them later. Step 2. Cut the cabbage the way you like it. You can use a food processor for it. Step 4. Put the cabbage and the carrots in a big bowl and mix them, while constantly pressing, with your hands. It is important to keep pressing vegetables so that the juice comes out. Step 5. Now it’s time to add the spices. Start with chilli powder, the quantity depends on your taste but you can start with ½ tsp, it won’t make your sauerkraut hot. Then add cumin, start with 1,5 tsp and than you can increase it according to your taste. Step 6. Now you have to keep mixing and pressing your sauerkraut for a few minutes to mix well the cabbage and carrot juice with the spices. Step 7. The last ingredient to add to your sauerkraut is water. Take some filtered water and put it on top of your mix just to cover it completely with water. Press it a bit and cover with the cabbage leaves that we put away before. Put a plate on top of the leaves and than put something heavy on top to press it well. Step 8. You have to wait 5-7 days and your sauerkraut is ready! Now you can transfer it into a fridge and enjoy it in salads and soups! How long can it be kept in the fridge before spoiling? Hi.. I’m new to fermenting.. Can I replace the cumin for celery seed? In one place you say chili pepper which could mean cayenne powdee? But in the instructions, you call it chili powder which according to the Internet is a blend of spices. Could you please clarify exactly what the red powder is? Thanks. I mean simply dried red chilli, ground, not a blend of spices.